I was recently on a trip to Cardiff, and on a search for some Welsh beer for Spectre we ended up looking in a large newsagent. Finding Welsh beer in Wales was not as easy as you might have thought, a branch of Tesco didn’t have any for example. We did finally find Cardiff beer in a large newsagent, and obviously I had a look at the chocolate available there too. Bars of chocolate for me I mean, for the train journey home. 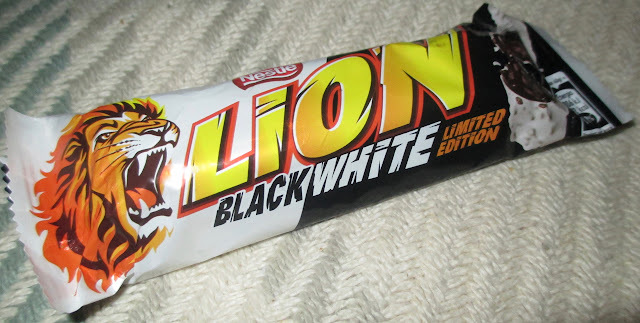 Anyway I found these Limited Edition Black and White Lion bars, and then forgot about them until today. Pretty shocking I know, but I was super excited when I rediscovered them again in the cupboard! So White Lion bars are fairly easy to find, usually in bargain shops or import shops, but this is the first time I’ve seen a Black and White Lion bar. 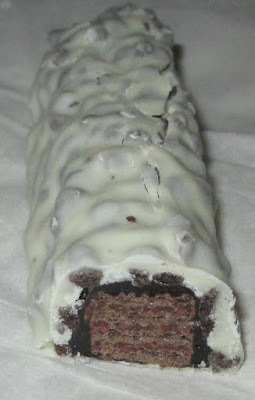 The Lion bar had dark chocolate wafers, dark chocolate and a coating of white chocolate on top, as well as all the usual crispie pieces and caramel. Firstly I chopped a bit off to have a look at the promised black and white colour scheme, I wasn’t disappointed, I thought the filling looked very dramatic. I bit in and found I loved the flavour of the bar. This chocolate wasn’t as sweet as the white chocolate version, and although the white chocolate added contrast the dark chocolate added a balance to the cocoa and made this very enjoyable. The caramel seemed more predominant too and had a deeper flavour, which I also really loved. I’d forgotten just how nice Lion bars are, and how satisfying all those wonderful mix of textures were to munch on. I now have to find a local stockist of this limited edition bar, which I’m sure will be easier than trying to find Welsh beer in Wales!